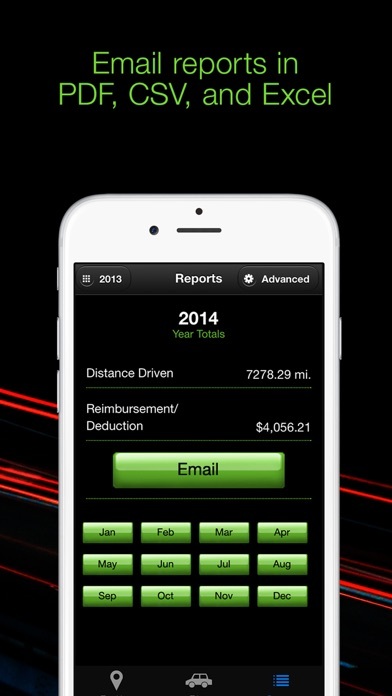 Automatic mileage tracking app for expenses, reimbursements, or IRS tax deductions. 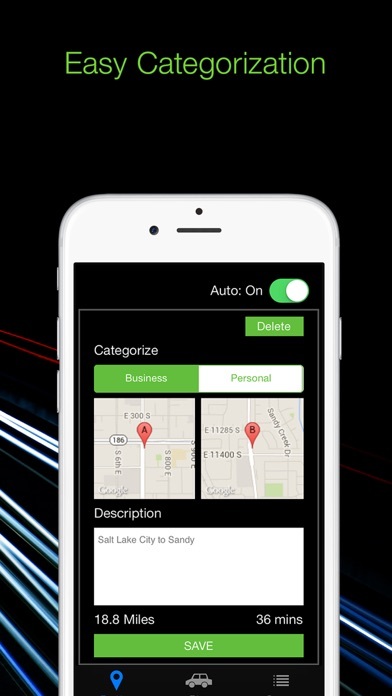 TrackMyDrive runs in the background and automatically detects all the drives that you make and then lets you easily categorize them as Business or Personal (or a custom category). 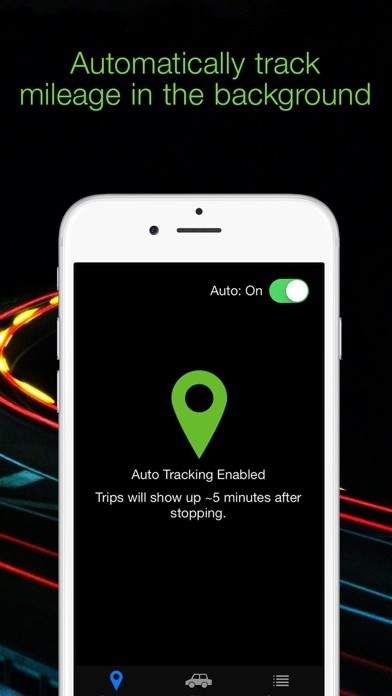 Unlike other mileage logs that only track the "start" and "end" locations, TrackMyDrive tracks your entire trip and automatically calculates your mileage deduction or company reimbursement. This app focuses on keeping things as simple as possible. Through eliminating unnecessary features and making the user interface simple to use. One of the best features of this app is that it automatically syncs with your TrackMyDrive account. This offers the following benefits: - Use your desktop computer to update and view your trips. - Print trip reports in PDF, CSV or EXCEL format. - Your data is backed up. If you lose your phone, simply re-download the app and login. - Data is automatically synced between all your devices. 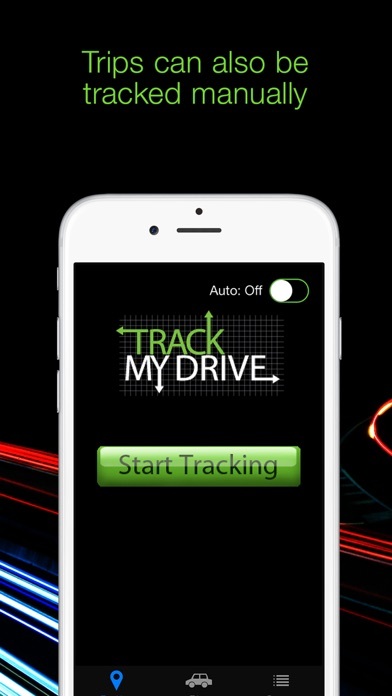 TrackMyDrive is the premier iPhone/iPad mileage tracker app. We are dedicated to continually improving the app and hope you enjoy using it! 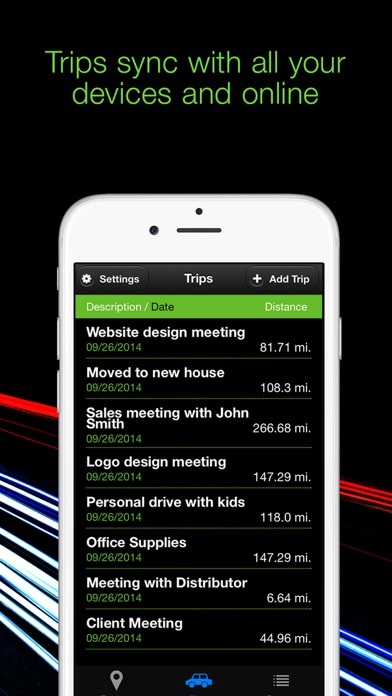 Other features: - Track your company mileage reimbursement. - Excellent customer service. - Manual entry of mileage logs and reimbursements. - Mileage deduction is automatically calculated. - Track miles using GPS. - Easy tax tracking and reimbursement tracking. - Accurate and detailed Mileage Log. - Use your phone as normal, the app runs in the background. - Excellent customer service, go ahead and send us an email to see how quickly we respond. - Allows for manually adding trips by address. Remembers and autocompletes your most used destinations. - Mark an entry as round trip to double the distance. - Miles or Kilometers supported. - Supports all major currencies. - Customizable mileage allowances. - Records start/end times of your trips. - Mileage Type Categorizing can be customized. - New IRS rates are automatically updated. --FAQ-- Q. Why doesn't your app have a place to enter start/stop odometer readings? A. Most accounting software will ask for starting and ending odometers OR total miles for a given tax year. Because we feel it greatly simplifies our program interface, our program is centered around the total miles accounting. You can also just type the odometer into the description field. Q. What deduction types are supported? A. For the United States: Business (56.5 cents), Medical/Moving(24 cents), Charity(14 cents), and Personal(0 cents). The deduction types are automatically updated to reflect the current IRS rates. Other countries we preload with a "Business" and a "Personal" category. You can also add your own custom mileage rates and purpose names. Q. What currencies are supported? A. We support all currencies. We auto-detect your currency when your account is created. --Pricing-- 10 trips a month - Free Unlimited Trips - $8.99 a year --Requirements-- Any IOS device that supports multitasking. (Minimum iPhone is 3GS) Use with a wifi-only iPad/iPhone is not recommended --Other-- * Continued use of GPS running in the background can dramatically decrease battery life. * A car-charger is recommended for long trips. No question this is the best. I tried out 3 apps and this is definitely the best one, most inexpensive as well... It’s a win win for sure!! I love this app it is easy to use and I can set it to track automatically or only when I want to. I love that I can email the record to myself as I need it for my tax files for my Mary Kay Business. I’ve used TrackMyDrive for several years. Over the past two years, I’ve experienced and continue to experience gaps in the data. Trips sometimes do not record, or if they record they start several miles into the trip. Sometimes when I get caught in traffic, it will record a straight line between the start and end of a trip. This is especially annoying when I’ve traveled extra miles to get around a traffic issue. I’m still rating it a 4 because it works great when it works, and if it doesn’t, it’s relatively easy to add trips. I used to love this app and it was so easy to use. Now it won’t consistently work with my iPhone and their customer service wasn’t able to do much for me. Very disappointing because I was very happy with this app for my business. This app stopped tracking my mileage. It appears to be working but all my trips show “0.” I’ve not received a response to my attempts to contact customer support. This appears to have happened after I updated the OS in my iPhone. I put up with partially satisfactory performance for months. The app did not log trips that I made, and spontaneously concocted tiny little trips each night that I did not make. Lately it has been a crapshoot. It logs maybe 30% of my trips. I’ve grown weary of entering them manually. If I have to do that, I might as well use a pencil and a notebook. I sent an email, reaching out to someone for some service/help ... have not heard a single word. I’m deactivating it and keeping it long enough to print a partial crappy report through October, but relying on a new app after that. I am, in a word, disappointed.